Samsung launches 10-year warranty for Quantum dot TVs | What Hi-Fi? Samsung's new SUHD Quantum dot TVs will be under warranty from screen burn-in for ten years. "Quantum dot" screen technology will be a new TV tech term for many people but an eye-catching 10-year warranty from Samsung may help change that. The technology works by adding a layer of nano crystals in front of an LED screen's backlight in an effort to improve the colours and brightness - and it looks like Samsung is focusing on Quantum dot technology over OLED for its 2016 TVs. 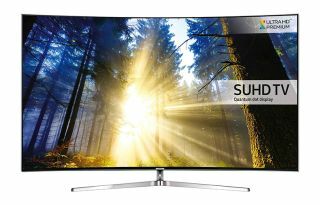 Now the range of Samsung SUHD 2016 TVs will be subject to a ten-year warranty for screen burn-in. This means if any area of the screen becomes permanently discoloured, leaving a permanent imprint on the screen, Samsung will repair or replace it.